In the Maryland, Virginia and Washington, D.C.area hundreds of automobile accidents occur daily. If you are injured during a car accident it is important to carefully understand the circumstances of the accident to determine whether negligence was involved. 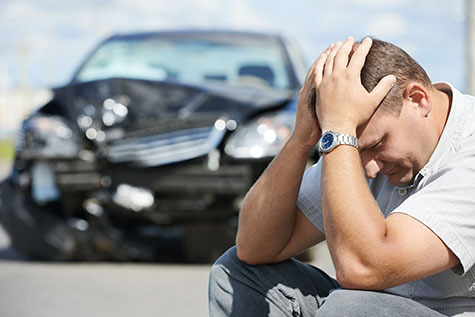 Auto accidents are very traumatizing and many car accidents happen through no fault of your own. For example: you may have been rear-ended by a careless driver, or side-swiped by a driver. Any type of vehicle accident has the potential to result in injury to the people involved in the auto accident. Damages resulting from an auto accident can vary widely, but will usually include property damage. If injuries are involved then medical expenses will incur and probably lost wages. Insurance companies want to avoid the legal process so they usually contact victims very quickly to settle the case out of court to save the insurance company as much money as possible. It is very important that you consult with a personal injury lawyer as soon as possible. You will need an advocate to make sure that you are compensated properly for injuries sustained as well as loses sustained due to the accident. Selecting the right attorney to represent you after an accident is very important. It can be the difference between collecting the full and fair amount you deserve or ending up with minimal or no compensation. For a free initial consultation with one of our lawyers, contact us at (301)987-2002. There is nothing to lose and everything to gain. Do not wait as certain legal rights may be waived. Call us now. Additional factors that are worthy of consideration include but are not limited to the following to ensure the most favorable result in your auto accident - personal injury claim. 1. Do not discuss your case with anyone other than your lawyer or its employees. If anyone desires information regarding this accident, please ask them to contact your lawyer's office. If you receive any checks from an insurance company payable to you and/or correspondence in the mail regarding your claim that is not generated by your lawyer's office, send it to your lawyer's office.. Some insurance adjusters and/or insurance companies have tried in the past to send out settlement checks to unaware claimants in the hope that once cashed, the minimal money offered settles the claim. Do not cash any checks you may receive from anyone as it could waive or settle your claim by mistake. 2. Be sure to send your lawyer all receipts, canceled checks, bills, and other papers pertaining to medical treatment, vehicle replacement/repair costs, loss of earnings, damage to personal property and any papers showing expenses connected with your case. 3. If you have any other accident, injury or illness, notify your lawyer immediately. 4. It is best to begin keeping a diary of your pain, suffering, and inconvenience. Any difference in your lifestyle as it existed before the accident, and as it exists from now on, might be extremely significant should this matter proceed to trial. Better to be too detailed than not detailed enough. Physical pain and suffering is important in the negotiations and/or trial of claims of this nature. Aggravation, humiliation, inconvenience, etc., due to no fault of your own is no less important than physical injury and pain. 5. Photographic evidence of your injuries, property damage, and of the scene surrounding your accident is essential to helping to secure favorable results in your personal injury claim. If you are unable your lawyer can make arrangements to have a professional photographer or investigator gather our evidence. 6. As you are likely treating with one or more medical providers (physician and/or a chiropractor) for your accident-related injuries, important to let your lawyer know the names, addresses and telephone numbers of any and all medical providers you have or with whom you intend to seek treatment. Your lawyer I will eventually contact them to request full and complete copies of all of your records and billings concerning your medical treatment. Your medical providers may be requested to submit a written report summarizing their current diagnosis, the treatment you received and the future prognosis including an estimate for future medical costs. Notify your lawyer once your medical provider has informed you that you have reached medical maximum improvement (MMI) and ends your medical treatment and/or physical. Because anything and everything you tell your medical provider could possibly be included in their official record of your case, you need to be absolutely sure not to express or give an opinion specifically as to how well you feel, the “good” progress you believe you are making, and/or anything you have discussed with your lawyer regarding the facts of your case and/or trial/negotiating strategy. You may feel great on the day of your treatment visit but actually experience pain for the next few days, weeks or months as this often occurs in the healing process. Such statements, however, could be used unfairly by the insurance company to limit and/or contest the extent of your personal injury claim to reduce its value. Remember, an insurance company will only pay what it thinks is reasonable as it is a "for-profit business. It is also important not to discuss and/or even advise your medical provider about your decision to make a personal injury claim and/or retaining a lawyer. This has nothing to do with your medical treatment or your health insurance and could be included in your medical records to your claims detriment. After you have reached MMI, your lawyer will re4quest and receive your complete medical records, billings and/or reports after you have been discharged from ongoing medical treatment. At that time, your lawyer will put together a settlement or demand package which will be submitted to the responsible party's insurance company. This claims package will consist of a letter outlining the facts of the accident, the medical expenses incurred to date, any other damages you may have received (lost wages, property damage, etc.,), along with a settlement offer that will be discussed with you in advance. A period of negotiation will ensure. If an acceptable settlement or your claim is achieved in your case, the insurance company will forward a settlement check to your lawyers office and a Release form that you need to sign to close our your claim. Your lawyer will create a Settlement will contact you upon receiving these documents and arrange a meeting whereby you can come into my office and sign the draft and release. Or, if that is not possible, the draft and the release can be mailed to you. Also at that time, I will issue you a check from my attorney-client trust account for the amount of the settlement less my attorney's fees and costs (pursuant to our retainer agreement) and any liens asserted by your health care practitioners. At that time, you will receive a written accounting of all monies received and paid out on your behalf during the course of your claim. Please be aware that my fees, any doctor's liens or other bills due will be paid directly from your settlement proceeds. If a satisfactory settlement agreement seems unlikely, I will contact you to discuss your options, which may include the filing of a lawsuit in this matter. As this law firm is expending a significant amount of time on this matter and will only receive fees based upon a favorable resolution, it is required that you follow all the directions in this letter. Please know that failure to do so at any time will cause a conflict of interest to be created with this law firm and may result in this firm withdrawing its representation. Finally, it is important that you are aware that in the State of Maryland, if a person wishes to pursue a claim against another person for negligent and/or intentional actions, a lawsuit must be filed within three (3) years from the date of the incident. In motor vehicle accidents, there may be insurance advisable to help you with medical and/or loss wages called Personal Injury Protection (PIP) Benefits. A claim for these benefit s have to be filed within one (1) year from the date of the incident. Your lawyer will aide you in filing for these benefits. It is recommended that you not allow your medical provider to access these benefits so be sure not to sign over your rights to them in the many forms you may be asked to sign. There may also be limited Personal Injury Protection Benefits (PIP) for lost wages/medical bills especially in automobile accident cases or medical reimbursement insurance (Med Pay) in types of claims that may be available and a claim must be filed for these limited/no fault type benefits within one (1) year. You need to discuss with your lawyer f this coverage is applicable to your situation and request in writing if you want me to pursue a claim. If your specific claim has not been, or cannot be, settled within these time periods, I will discuss with you the filing of a lawsuit on your behalf to protect your claim. Please calendar these expiration deadlines and alert me before expiration to ensure these are not missed. In a Protective or Domestic Violence claim, a Petition is filed by the person asserting they have been wronged. When a court-ordered process in which the legal record of an arrest or a criminal conviction is "sealed," or erased in the eyes of the law. Two parties are embroiled in a legal dispute seeking money or other specific legal performance rather than criminal sanctions, a civil litigation is the result. This must then be decided by a judge or jury trial. The firm provides free consultations and payment plans for most legal matters. It is our desire to provide exemplary legal representation to our clients. About Stephen F. Allen, P.C. The Law Offices of Stephen F. Allen, P.C. has been providing quality legal representation at affordable prices for over 30 years; serving all Maryland Counties & or and the District of Columbia, in such areas; as Civil and Criminal Litigation, traffic defense, automobile, personal injury accidents and many other matters. DISCLAIMER: The materials contained on this website have been prepared by the Law Offices of Stephen F. Allen, P.C. for informational purposes only and does not constitute legal advice. Transmission of the information contained on the Law Offices of Stephen F. Allen, P.C. website is not intended to create, and/or receipt does not constitute, an attorney-client relationship. Online readers should not act upon this information without seeking professional counsel. The firm does not endorse, and is not responsible for, any third-party content that may be accessed through this website. © 2012 - Law Offices Stephen F. Allen, P.C - All Rights Reserved.